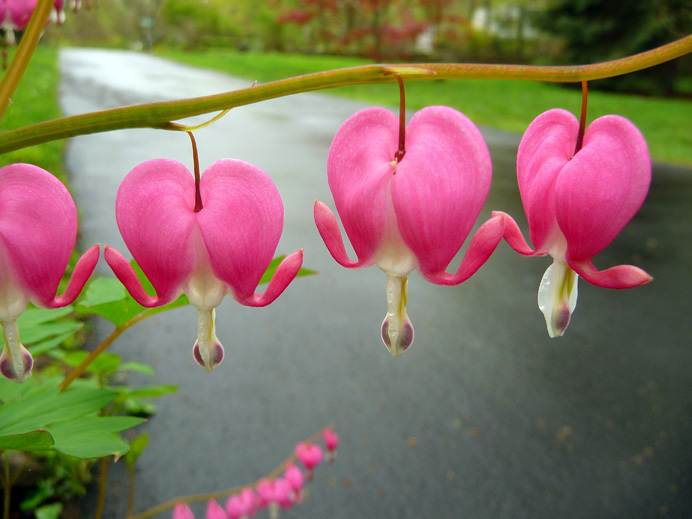 Walking up Kilian Drive today, I found a gorgeous garland of Bleeding Hearts next to a neighbor's shiny wet driveway. I never see these oddball flowers (Dicentra spectabilis) without thinking of Kenneth Crosser, a high-school civics teacher and Boy Scout leader who lived next door when I was a child. Kenny (everyone, even kids, called him Kenny) had a remarkable talent for surprise. He looked beneath the surface of things. He knew secrets about animals, plants, rocks, fire, butterflies, Presidents, bicycles, planets—the universe. "What do you see here?" Kenny asked me, plucking a Bleeding Heart from his garden one morning when I was six. "A flower?" "Things are not always what they seem," he replied. "Hold out your hand." As I stretched forth a grimy palm, Kenny began pulling the flower apart and laying the pieces side-by-side. "Here you have twin rabbits," he said, starting with the matching pink shells. "And here's a pair of slippers...three pairs of earrings...a baseball bat...and a ball!" Over the many years since that day, I've shown Kenny's Secret to dozens of children, including my own. It never fails to delight. I tried it again today when I got home from my walk. If you look at the pieces below, you'll see that Kenny was absolutely right.